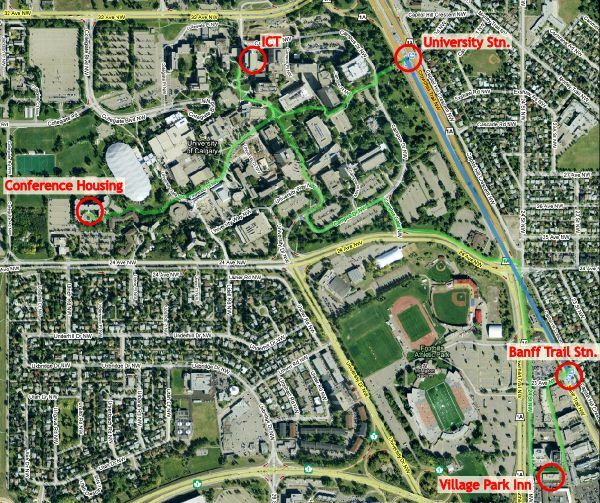 A block of rooms has been reserved at University of Calgary Conference Housing. Rooms will be allocated on a first come first served basis. The block of rooms will be released after June 22.
print off the reservations form that can be found at the bottom of this webpage and and fax it to +1 403 220-6760. In order to get the reduced rate, please indicate that you are a PODC or SPAA participant. Two and Four Bedroom apartments can be booked per bedroom or per apartment. Only a limited number of Studio apartments and Hotel Suites are available. Rates subject to 5% GST and 4% Alberta Tourism Levy. A block of rooms has been reserved for PODC/SPAA participants at the Best Western Village Park Inn. The block of rooms will be released after June 30. To get the reduced rate, you must mention that you are a PODC or SPAA participant. It takes about 30 minutes to walk from the Best Village Park Inn to the lecture rooms. You can also take the northbound C-train one stop from "Banff Trail" station to "University". The University is a 20 minute C-train ride from downtown Calgary. From the University C-train station, it is a 5 minute walk to the ICT building, where the technical sessions are held.